Join over 2,500 jewellery designer/makers for free today! 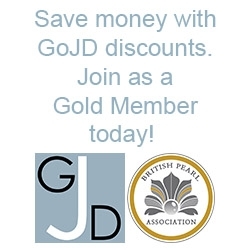 It can be expensive to set up and maintain your micro or established jewellery business, the GoJD is here to support you and help you save money. Please use the search bar above to find suppliers or services offering discounts. UR Fogging security cannons are an essential part of an effective anti-bandit solution especially in jewellery store security and high value goods or cash related businesses. Bellore Ltd. is a major supplier to the Jewellery industry offering a very wide range of supplies for jewellers. With our engraving service, there are a few simple things you need to include when sending work in to us. By making sure you include as much information, we can give you the best possible engraving service.